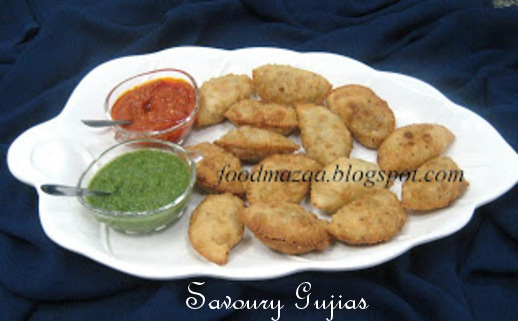 Gujias / gujiyas are basically stuffed pastry with some filling which is deep fried. The sweet version is most popular and made during Holi festival with mawa / coconut filling. I have made the savoury version with aloo masala filling and it makes a nice party snack. Cumin powder ........... 1 tbsp. Turmeric powder ........ 1 tsp. Dry mango powder....... 1 tsp. Methi leaves ...handful (or) kasoori methi .....1 tbsp. 1. Boil the potatoes and cut them into small pieces. Soak chana dal for 2-3 hours and boil it with salt.Take care not to over cook. 2. Mix all the spices, salt, green chillies, coriander and methi leaves, potatoes and dal. 4. Knead the white flour with salt, ajwain. 2-3 tbsp. of oil, adding little water. 5. Roll out a small portion of the dough. 6. Place it in the gujia mould, put the filling and make the gujias. 7. Deep fry and serve them hot with chilli sauce and mint chutney. wow lovely gujiyas...first time here..wonderful blog..like ur blinky girl..
soo cute. I love any fried snack. These gujiyas with a different filling are tempting. I only make sweet gujjias, but these sound like a great idea.